UPM Biofuels and the Zero Emission Resource Organisation have started cooperation in promoting a shift to green transportation and petrochemicals sectors. The work focuses on creating a predictable long term operating environment for sustainable, advanced biofuels to enable climate change mitigation to encourage green transport with renewable fuels. The cooperation also aims to enhance knowledge of sustainable fossil-free bioproducts, such as bioplastics, as an important climate solution for example in the packaging and labelling industries. The work is conducted through continuous dialogue with policy officials and decision makers to promote the transition towards a wider bioeconomy. 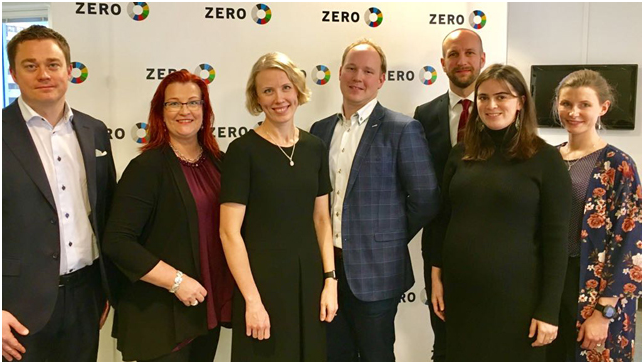 “ZERO is a Norwegian environmental organisation that focuses on greenhouse gas reduction through promotion of new technologies enabling emission-free energy solutions without harming the environment. ZERO and UPM Biofuels share the same vision and therefore we see great value in this cooperation,” says Kåre Gunnar Fløystad from ZERO. UPM and ZERO support advanced biofuels and sustainable bioproducts, which considerably reduce greenhouse gas emissions during their lifecycle from raw material to end product when compared to fossil fuels and products. UPM’s Markku Purmonen (left), Sari Mannonen and Maiju Helin together with ZERO’s Kåre Gunnar Fløystad, Anders Tangen, Anne Marit Melbye and Kristin Brenna.